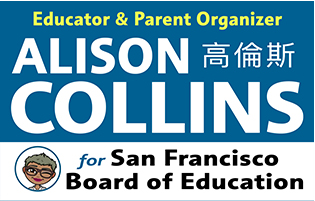 Over the past several days, I’ve heard from several readers who are now in wait pool hoping to get enrolled in their preferred SFUSD schools. This happens when families DON’T get one of the eight schools they choose for enrollment. I wrote a post a while back entitled: Don’t Freak Out! Your Kindergartener Will Get into a GREAT Public School! It garnered a lot of views because I think it resonated with a lot of parents eager to find a great public school for their child, but wary of all the horror stories they hear about the public school “lottery” enrollment system. 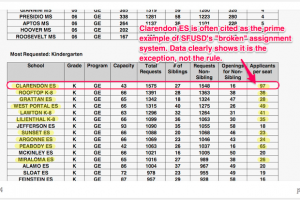 The Waiting Game on the SFUSD Wait Pool: How many parents actually get their “choice” schools? 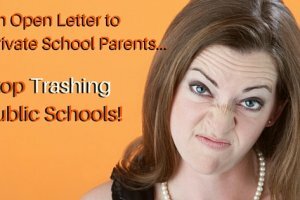 Getting this message made we wonder just how many parents ACTUALLY get their “choice” schools? So, I went online to the SFUSD website to see enrollment statistics to get a sense of the Big Picture. Even though 60% of kindergarten applicants got their first choice and and 87% of kindergarten applicants got one of their choices, that still leaves a considerable amount of parents unhappy. Thinking about this, I realized this has a lot to do with our choice system, which will logically result in some schools getting more applicants (Clarendon, Rooftop, Sherman…). The limited number of spaces available at each school means some high-choice schools will have far more applicants than spaces (Clarendon tops the list at 97 applicants per seat!) Thus, it only makes sense that when parents place ALL high choice schools, they may NOT get any schools on their list. In contrast, in looking at placement request reports for last year at my daughters’ school Jean Parker, there were only seven applicants which put it as a first choice. So anyone who picked it, could almost be guaranteed a space. 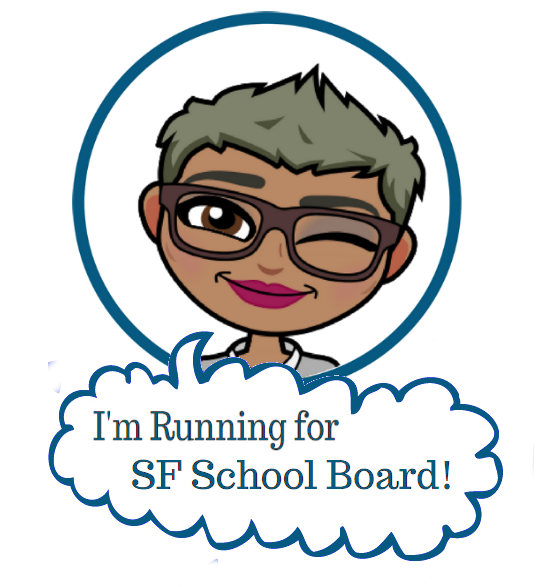 So, I reached out to the reader and let her know that even though I didn’t have have experience going through the SFUSD wait pool process, I understood how stressful it is worrying about our kids having a great “first school” experience. I encouraged her to consider schools with openings that may not have been on her original list. There are many GREAT neighborhood schools with little visibility, that she wouldn’t have a problem getting into. Next, if the school on her wait list is a school she absolutely LOVED, I encouraged her to be patient and wait it out. I know several families who enrolled at my daughters’ school our kindergarten year who moved during the first two weeks… one with TWINS! We actually made friends with them and have stayed in touch, sharing resource to support our respective PTO/As. Our friendship is how I know their daughter acclimated to the new school just fine and made LOADS of friends all the same. Additionally, I have several other friends who have moved mid-year or even several years later and their children are all happy well-adjusted kids! 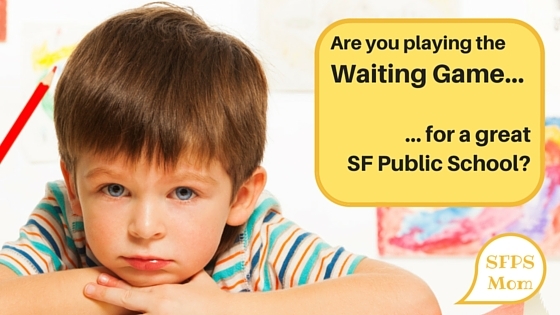 The Waiting Game on the SFUSD Wait Pool: From LindaKay B. “Our eldest was randomly placed for kindergarten years ago in an elementary school we’d never heard of and which on the surface did not look like a good fit for our family. We reluctantly accepted the assignment, but stayed on the wait pool for our first choice school. Additional assignment rounds passed before school started, but we remained stuck where we were. At the 10-day count, we were offered a chance to move up, but declined it to gamble on what we’d discovered about our principal and community in the interim. “My daughter is in 10th grade now but when we were assigned a middle school it was none of the choices we listed. We ended up getting her into another school that had some openings, although it also was not any of our listed choices. Within the first week she wanted to be removed for any round 3 placement or waiting pools. She flourished at the school she ended up in and excelled in her grades, far exceeding any expectations we had about the school. She has met many kids in her high school that went to the middle school she was originally assigned and they did fabulous there too. In my humble opinion, I don’t think any amount of touring and test scores and literature will ever fully paint the picture of what school will fit your child perfectly. Of course, we all have our preferences when we choose and apply for schools, but from my experience, I’ve known many families who ended up in schools they hadn’t considered or applied for while on the waiting list and ultimately loved the school they were placed in!! I know the first few weeks are SO stressful! Just know, from a teacher perspective that nothing REALLY important happens in classrooms during the first few weeks in terms of instruction. Teachers are all just getting into the groove and waiting to see how class lists settle out. If you transfer to another school your child will integrate into the class just fine just like the other kids. Later on, you’ll look back on this (REALLY) stressful time as just a bump in the road. And for anyone wondering what happened with the reader who originally contacted me… she recently found out she got her wait pool school and her daughter will be starting kindergarten this Monday! Wohoo! 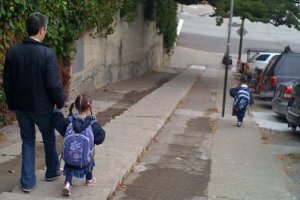 The Waiting Game on the SFUSD Wait Pool: Let’s keep it going! Did you end up staying and loving your assigned school? Did you move after a week and keep friends from your old school? Did you happily end up somewhere totally unexpected? Please share your experience. It always helps to get reassurance from other families who’ve “been there.” And, if you are willing to connect directly with families, please share that as well.